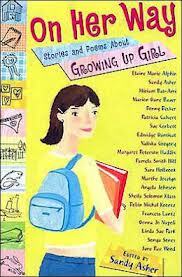 A first-rate collection of authors who write for young readers created new stories and poems for this anthology, all featuring strong, young female protagonists. I’ve included one of my own stories, “The Secret Behind the Stone.” Bonus: The authors’ photos show them as they were at the ages of their readers. I’m shown wearing my favorite ballet costume! This book is out of print, but copies are available on-line and also directly from me. If you’d like a personalized, autographed copy, send me an email at sandyasher@gmail.com for ordering details.